Lauren Uhlig, a senior environmental studies and fisheries and wildlife major, presents findings from her summer UCARE project during a poster session Aug. 7 at the Nebraska Union. Uhlig worked closely with Deborah Bathke, a climate scientist at the National Drought Mitigation Center; and Theresa Jedd, an environmental policy specialist at the drought center; on the project. While many college students were hiking, biking, camping or spending time at a lake this summer, Lauren Uhlig was busy researching drought perceptions and how they impact outdoor recreation in the Great Plains. Uhlig, a senior environmental studies and fisheries and wildlife major at the University of Nebraska–Lincoln, created a short survey to gauge people’s preferences between state parks and recreation areas experiencing extreme drought and those under near-normal conditions. She then asked the respondents which outdoor activities they were interested in participating in at their preferred locations. Uhlig, an Omaha native who is also enrolled in the Master of Public Health program at the University of Nebraska Medical Center, had previously conducted research as an intern at the National Drought Mitigation Center, where she has worked since last October. 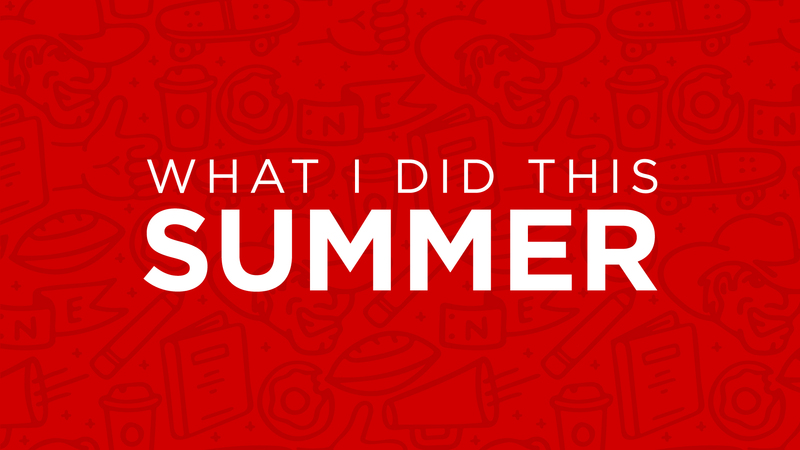 She participated in the summer project through the Undergraduate Creative Activities and Research Experience program at Nebraska, which allows undergraduates to work closely with faculty mentors. Deborah Bathke, a climate scientist at the drought center; and Theresa Jedd, an environmental policy specialist at the drought center; were co-advisers on the project. Uhlig recently discussed her UCARE project with Nebraska Today. Where did the idea for this project come from? Why is it an important area of study? The idea came from my previous research. I was interested in seeing how drought can impact an individual’s perception of the landscape. I wanted to know if drought could make an impact on an individual’s desire to recreate in that space and if some activities were at a greater risk during drought than others. This is an important area of study because outdoor recreation has connections to many aspects of life. It provides millions of jobs and has a significant impact on the economy. It also promotes healthy living, as it provides countless opportunities to engage in physical activity. Regular physical activity is shown to decrease the risk of chronic diseases related to obesity and improves quality of life. Outdoor recreation relies heavily on the landscape. If something like drought were to drastically change the features of a state park or recreation area, these benefits may not be seen. With climate change altering weather patterns and temperatures continually rising, it is necessary to understand how individuals perceive drought landscapes. This knowledge can hopefully help park managers plan for the future to limit the negative impacts of drought. Which state parks and recreation areas did you choose for the project? I used the drought monitor map created by the National Drought Mitigation Center to identify an area that was under drought conditions. I decided to travel to a portion of central Kansas that had been in extreme drought for several weeks. I visited four state parks or recreation areas there: Cheney Reservoir, Sandhills State Park, Tallgrass Prairie National Preserve and Harvey County West Park. My goal was to capture a variety of landscapes, including lakes, river/streams and grasslands, and these locations allowed me to do that. For comparison of landscapes within 70 percent of normal conditions, I was able to go to locations around Lincoln. I photographed Branched Oak State Recreation Area, Louisville State Recreation Area, Spring Creek Prairie Audubon Center and Frank Shoemaker Marsh. These areas had similar landscapes to the ones I photographed in Kansas. 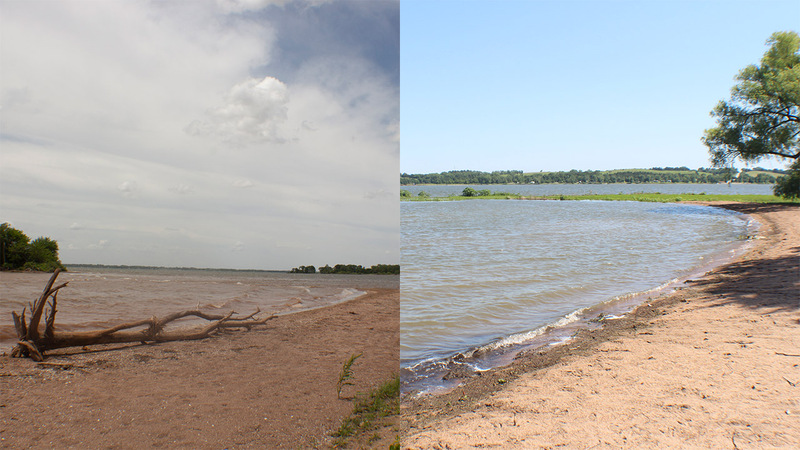 Cheney Reservoir (left), in extreme drought, and Branched Oak State Recreation Area, under near-normal conditions. With water-based landscapes, survey participants strongly preferred non-drought locations. What did the survey look like? What questions did you ask? I created my survey using Google Forms. I asked questions about participation levels in outdoor recreation and which activities were regularly participated in. I then created a comparison of the various landscapes and asked participants to choose which area they would rather recreate in. I did not disclose which area was in drought and which wasn’t, to prevent bias in the survey. Seventy-eight people completed the survey. Most of the responses came from online promotion. I also set up tables at the rec center and Nebraska Union to get more responses. At these locations, I used printed photos to display the comparison. What did you find? What were you most surprised by? I found that drought has varying impacts on an individual’s perception of the landscape. With water-based landscapes, participants showed a strong preference for the non-drought location. The comparison of a small lake or pond led to a very strong preference toward the non-drought location, with 98.7 percent of respondents reporting that they would rather recreate in the non-drought location. I think I was most surprised with the significant difference between water-based landscapes and grassland areas. The comparison of the grassland landscape showed that most respondents had no preference between the two locations and would likely recreate in either area. This indicates that grassland landscapes are more resistant to the impacts of drought. 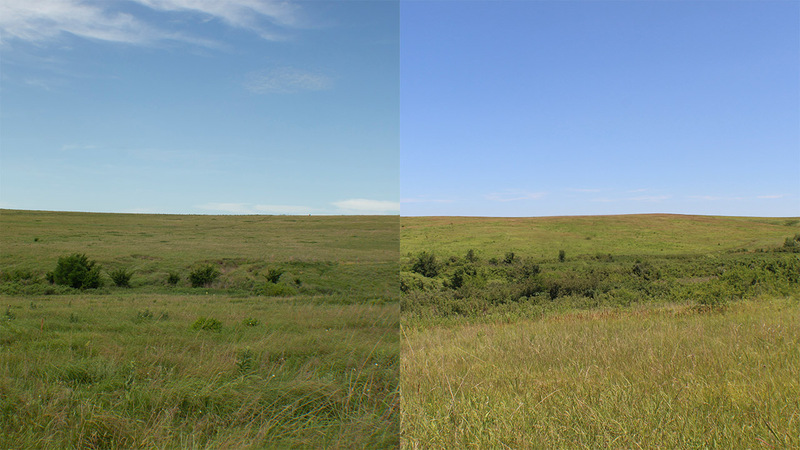 Tallgrass Prairie National Preserve (left), in extreme drought, and Spring Creek Prairie Audubon Center, under near-normal conditions. Survey participants showed no clear preference between the grassland landscapes. How might outdoor recreation providers and park managers use this information? They can use this information to plan for drought. This data shows that water-based landscapes are most at risk during times of drought. Park managers working at lakes or streams can work to ensure that beaches are still appealing when water levels are down. Simply removing vegetation from a beach or having docks that can be adjusted to the water level could encourage more individuals to recreate in the area. Park managers could also promote activities that don’t rely on water — things like hiking or biking. If the recreation area is a large reservoir and the water level can be controlled through a series of dams, managers can consider retaining more water in the lake to maintain participation levels. What impact might drought have on the future of outdoor recreation? If drought becomes more intense and more frequent with climate change, the popularity of certain activities may shift. We may see less interest in water-based activities and more interest in other types. We also may see more willingness to drive greater distances to be able to participate in activities that may not be available around an individual’s home. I also think that there could be potential for new outdoor recreation activities to develop. If individuals are limited in their options, creativity may lead to something new. It is also possible that overall participation in outdoor recreation may decrease in an area where drought has intensified. I think with proper land management and promotion of a variety of activities, this outcome could be prevented. What did you gain from the experience of conducting research? Do you hope to use these skills in the future? I think I gained a lot of great skills. This was the first time I got the chance to design a research project. I had to rely on my own knowledge and not doubt the decisions I was making. I learned a great deal about how to construct surveys and phrase questions. It was challenging to design a survey that collected the information I was looking for but that was also easy to understand and an appropriate length. I think I gained the most from learning how to properly analyze data. Once you have a data set, there are hundreds of ways to represent it in graphs and percentages. I had to really think about what information I was trying to portray and the best way to display that for the public to understand. I hope to one day work in the field of public health, and I know that these skills will come in handy. Public health is centered on understanding the habits and beliefs of the public and developing ways to alter these habits and beliefs to promote a healthy society. Doing research and surveys will likely be a large part of my career, and I am thankful that I gained so many useful skills with my UCARE project.